The KZN Philharmonic Orchestra is as at home performing in community halls as it is performing in concert halls – embarking on regular education and development outreach programmers to proactively introduce the beauty of orchestra music to all of the people of KZN. This week, the orchestra is spending Thursday morning (April 12) at Amaoti Community Hall; Friday morning (April 13) performing at Siphosethu Primary School, Ntuzuma, and Saturday afternoon (April 14) from 13h00 at the Nelson Mandela Chatsworth Youth Centre for an event to honour the Mandela legacy – Madiba’s 100 year commemoration, and honouring the passing of Winnie Mandela. 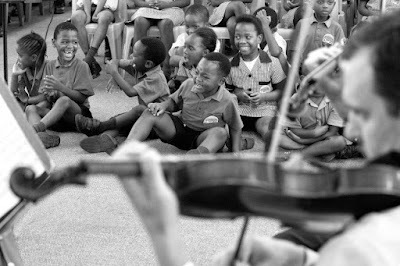 Outside of the KZN Philharmonic’s World Symphony Series and other high-profile public concerts, they also have an extensive and geographically far reaching programme of taking the orchestra to schools across the province to introduce primary and high school learners to the concept of music appreciation. A series of well-scripted programmes introduce children to orchestral instruments and the power of music thereby allowing learners to better understand the complexities, benefits and accessibility of an orchestra. Every year, the orchestra performs at over 100 schools throughout the province. They perform in the cities, suburbs, rural communities and in the townships, touching the lives of in excess of 42,000 pupils across KwaZulu-Natal. At the Educational concerts, the programme includes the classic music tale which introduces the instruments of the orchestra in the guise of a children’s story, Peter and the Wolf which can be narrated either in English or isiZulu. It has been translated by master story-teller, Dr Gcina Mhlophe, and will be narrated by Nompumelelo Ndlovu. As well as performing Peter and the Wolf, the educational repertoire covers music from familiar themes. The programme included popular soundtracks which range from South Africa’s national anthem to James Bond, Star Wars, Pirates of the Caribbean and Pharrell William’s clap-along ditty, Happy. The concerts this week will come to a close with different school choirs being accompanied by the KZN Philharmonic Orchestra. “While serving South Africa with distinctly professional orchestral performances, the KZN Philharmonic also dedicates much of its time and energy to enriching local communities through its education and development and outreach programmes. When they are not performing symphony concerts, the orchestra implements an extensive education and development programme in which they introduce learners to the joys of classical music,” explains Bongani Tembe: Chief Executive and Artistic Director of the KZN Philharmonic. Or click on the KZN Philharmonic's banner ad at the top of this page which will direct you to the ochestra's website.